Soy wax candles + gifts inspired by classic detectives! Note from shop owner We're taking an extended hiatus. Both of our stores at flamenoircandleco.com and Etsy will be on vacation starting February 1. In the meantime, the blog at flamenoircandleco.com/blog will still be up and running. We're taking an extended hiatus. Both of our stores at flamenoircandleco.com and Etsy will be on vacation starting February 1. The aroma of Holmes abounds in my library. Pregnancies or is advertised! Taking an extended hiatus. Both of our stores on Etsy and at flamenoircandleco.com will be on vacation from Feb 1 - May 1, 2019. Please get your orders in by Jan 31 - otherwise we'll see you in the spring! Flame Noir's Mother's Day Favorites - for mom's who love mystery! Scents on sale for mother's day include Hercule's Rose, Hotel Normandie, St. Mary Mead & Mitchell House & Flame Noir wax melts. Use the code: MOMSOLVEDIT and receive 10% off until May 13! On the scent of the best detectives of film and print! 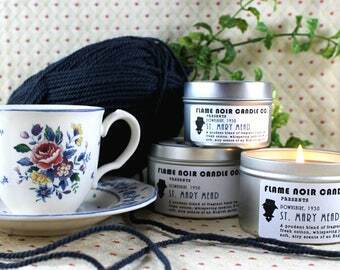 Flame Noir Candle Co. is a small, specialty boutique business located in Richmond, Virginia, offering homemade, hand-poured, soy wax candles & gifts in scents that are inspired by some of the greatest classic detectives of film & print. Unique Gifts: Our handmade candles & gifts make perfect presents for your mystery loving family & friends. Give gifts that get talked about! Unique Scents: We create all of our own, old-fashioned, vintage-styled scent blends in-house. You won't find our scent blends anywhere else! Handmade with a Heart: All of the products we offer are handmade using only the finest quality ingredients. Our products are never tested on animals! All Natural: Our candles are pure soy and do not contain additives or dyes. Our products are vegan and are lead, phthalate & paraben free! Our Wicks: Our specialty wicks are cotton with a paper waive, dipped in beeswax. We never use wicks dipped in palm or paraffin wax! Custom Orders: We offer custom creations for your detective or mystery themed events. Contact us for more info on pricing and time frames! At Flame Noir Candle Co., our goal is to create handmade, superior quality candles and gifts that are safe, earth and animal friendly & promote the vintage lifestyle. We seek to enhance the mystery & detective literature, films, games, radio programs, magazines & other media that we love so much. Light a candle, select your favorite detective novel, movie or program and enjoy a full sensory experience aimed at stirring your imagination. Mission Statement: At Flame Noir Candle Co., we believe that chandlery is not just about the technical aspects of candle making, but also the artistry of creating perfectly blended scents that are unique and memorable. Scents not only create atmosphere, they affect our moods and spark our imagination. To this end, we create all of our own, old-fashioned scent blends in-house, using only the finest premium fragrances with the goal of capturing the spirit of our favorite detectives, sleuths and crime solvers of film and print. Each new, vintage-styled scent blend is extensively tested before release to assure quality, scent harmony, achievement of concept and fragrance longevity. DO NOT BE FOOLED by the new crop of competitors, who upon seeing our original business idea, have jumped on the bandwagon of selling detective themed candles. To simply open a bottle or two of fragrance oil, add it to the wax, and name it after a detective misses the point and will never come close to matching the time and effort that is spent on crafting our original Flame Noir creations. We hope you know that Flame Noir is the first of our kind, and the only company on the web that offers ONLY detective themed candles. We are dedicated to perfecting detective and mystery themed scents that cannot be duplicated. We extensively research each detective along with the scent notes of colognes and perfumes that were popular during the era in which that detective was featured. Using those two tools, (along with our lifelong passion for detective fiction), as our base, we create our original scent blends using our imaginations as stoked by the atmosphere of the books, films, TV programs and other media featuring each detective in order to offer our customers something that is personal, artistic and truly unique. Hard-boiled detectives and handmade candles - my two favorite things collide! Scott designed the logo for Flame Noir. Without his loving support and motivation, I would probably just be sitting somewhere reading detective novels! How do I pick the right scent for me? Check for full descriptions on each candle's page or try a 6 tealight sampler set! What are the burning instructions? Do these candles contain lead or lead cores in the wicks? What about dyes or additives? "Mushrooming" at the end of your wick is simply carbon buildup and may happen from time to time. It is typical of core-less/lead free wicks. To quickly and neatly trim your wick, we recommend turning your cooled and hardened candle upside over a garbage bin where you may simply trim or pinch the excess wick to 1/4 of an inch. Prior to relighting, make sure you clean away any soot or debris from the candle surface. Yes! Bulk orders are available. Please contact us with your inquiries for pricing and an estimated time frame on order fulfillment. Special custom commissions, including new scent creation with custom labeling & candle inserts are available and are approved on a case-by-case basis. Prepayment in full is required for all custom commissions. Please note that once the commission is completed, Flame Noir maintains ownership of the scent and branding and may decide to feature the scent as a candle and/or rooms spray for sale in our store at a later date. All custom commissions will need to fit into the Flame Noir detective and/or mystery theme in order to be approved. Are your candles, wax melts & room sprays Phthalate free? Scent Blends: All-Natural. Vegan. Phthalate, Alcohol, Cruelty, Gluten & GMO free. INGREDIENTS: Premium natural fragrance oils, water, polysorbate 20 & 80 (surfactant & emulsifier), sodium laurel sulfate, disodium cupic citrate, (antioxidant), citric acid, methylchloroisothiazolinone, (antifungal preservative), methylisothiazolinone (preservative), ethyl alcohol. Do you offer returns on your products? Due to the nature of these homemade products, we cannot accept returns. Once the products leave our hands, we can no longer guarantee their integrity, and therefore, they can't be sold to anyone else. If you have a quality or shipping issue with your order, or if you have received the wrong item, please contact us! Our candles and wax melts ship world-wide! We are sorry, but at this time our liquid products, (room sprays), ship within the 48 contiguous United States only. INTERNATIONAL BUYERS PLEASE NOTE: Import duties, taxes, and charges are not included in our item pricing or shipping cost. These charges are the buyer's responsibility. SHIPPING TO CARGO HOLDS: Please note that we are happy to ship to your cargo exporters for cargo shipment overseas by a 3rd party provider. We hope you understand that our packages may be opened and resealed by the cargo service. If there is a problem with packaging, please consult your cargo providers to learn if a package inspection has occurred. As always, let us know if there is a problem on our end! Why is there discoloration or a slight pink color on the interior of my candle tin? Although there are many suppliers of treated candle tins are on the market, Flame Noir Candle Co has decided not to use candle tins that have been “varnished” on the interior with what we feel is an unnecessary chemical wash. As a result of our choice to avoid the use of varnished tins, (and because we do not use additives or dyes to disguise or chemically eliminate any natural discoloration), you may notice a slight pink color on the interior of your candles in scent blends that contain vanilla or other spices. Not to worry! This “tin pinking” is simply a natural chemical reaction to the vanilla and/or spices. It is not a product flaw, and will not affect the scent or the performance of your candle. Breathe confidently – breathe safely!